Saddle up for a magical journey! How about a little equestrian trail ride at Domaine du Marquenterre with your children? 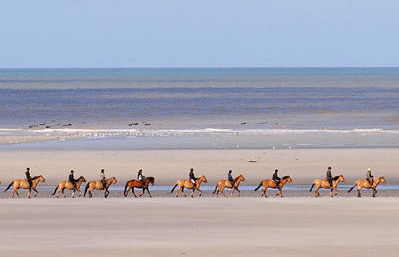 Don’t worry if you don’t have horses: the Hensons, otherwise known as the Bay of Somme horses, are the world’s most gentle! As docile as can be, they are appropriate for everyone, even the smallest riders. Choose your companion following good advice from the guide, and get ready to put your feet in the stirrups for a great adventure! You’ll be surrounded by nature! You’d almost think you were in a film! With your hair blowing in the wind, you’ll ride through dunes, forests, clearings and other magnificent landscapes. You’ll experience a sensation of total freedom and will discover with amazement rare sites, almost devoid of human presence. At the turn of a bend, you’ll cross the paths of wild animals: boars, wild pigs and bighorn sheep… Your children will be thrilled! You’ll feel in osmosis with nature! You’ll love the end of the afternoon, when the rays of the setting sun take on warm tones and shine through the tree branches. As a bonus, rides along the beach or even in the water can be organized so that you can fulfill your childhood dreams!